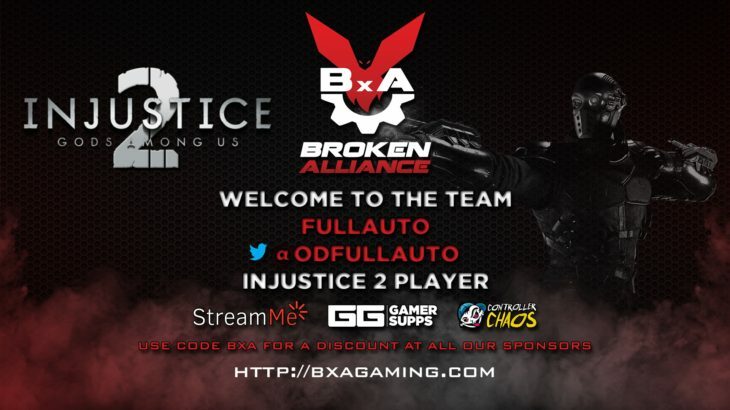 BxA Gaming is excited to introduce a new member to our Injustice 2 team: please welcome, ODFullAuto! FullAuto had this to share after his signing: I’m an NRS player known as ODFullAuto, one of Four OD Members with a goal to be the best in the world in ESports. I’m well known for my zoning skills and character loyalty in MKX and Injustice 2, and hopefully with these skills I can become one of the best in the NRS scene. I want to thank BxA for giving me this opportunity and I’m looking forward to working with them. FullAuto will be representing us as well as OD, alongside his longtime comrades 2eZ, Atai, and Alcatraz, with FullAuto himself rounding out the OD crew. His Jacqui and Deadshot loyalty are unmatched, and his mastery of the zoning playstyle is impeccable. He will prove a force to be reckoned with as he wears the BxA banner, going around the country while taking contracts in the name of Floyd Lawton. Welcome to the BxA Family FullAuto! We are excited to work with you! Thank you to the #BxAFam for all the support.